It was always going to happen.Â The world’s most pre-order video game is smashing records left right and centre with supplies exceptionally limited. In the UK the game sold a record 609,000 copies on both consoles on the first day of release.Â This breaks the previous record of just over 500,000 sold by Grand Theft Auto: San Andreas in 2004. Around 280,000 PlayStation 3 copies were sold on the first day compared to 330,000 XBox 360 copies, even more evidence that the PS3 is closing in on the XBox 360. Total UK sales alone netted Â£24 million ($48 million) in one day. We are still awaiting the initial sales figures worldwide and from the US and North America.Â Halo 3 holds the record for the best first week sales of any video game, and in the UK at least we will know next Tuesday when Charttrack reports on the first week sales. 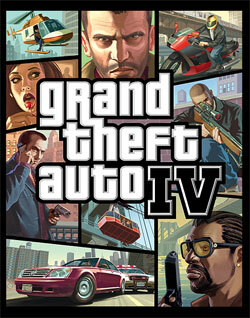 Already the GTA IV effect is having a massive effect on PlayStation 3 console sales with many gamers who had not moved to the fifth generation consoles, using this opportunity to purchase a console.Â Over 80% of people purchasing a console with Grand Theft Auto IV are choosing the PS3 over the XBox 360.